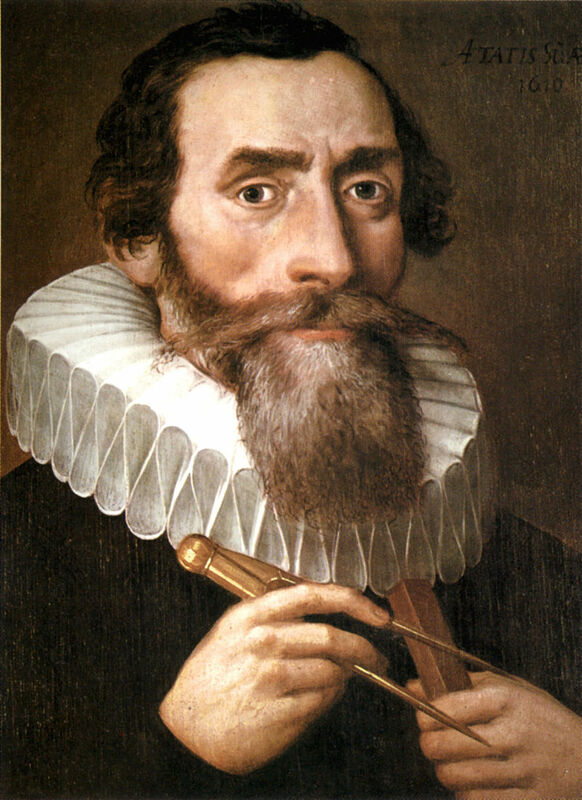 My latest post is about the work of the German astronomer Johannes Kepler (1571-1630). He is most famous for his improvement to the earlier model of Copernicus by introducing the idea that the planets move in elliptical, rather than circular, orbits and that their movements in these orbits are governed by a set of laws, which became known as Kepler’s laws of planetary motion. However, as I’ll talk about later, he also made many other major contributions to astronomy and mathematics. As readers of a previous post will be aware, in 1543 the Polish astronomer Nicolas Copernicus (1473–1543) published a theory in which the Earth and all the planets orbited the Sun. Prior to Copernicus, the generally accepted view was that the Earth was the centre of the Universe and the Sun, the stars and the planets were all in motion around it. However, like all astronomers before him Copernicus believed that the planets’ orbits must be perfect circles. So, to make his theory fit the observations of the positions of the planets, each planet moved in a small circle called an epicycle and the centre of the epicycle was in orbit around the Sun. This is shown in the diagram below. The fact that Copernicus’s model, like the geocentric model, still required epicycles gave it a rather complex and unsatisfactory feel. This complexity and the religious objections that Earth was not at the centre of the Universe were reasons why the model was not adopted more widely. Kepler made a huge advance by improving Copernicus’s model into the one we use today. However, before I go onto talk about Kepler’s work, I’ll just give some background on ellipses, as I assume it may have been some time since many of my readers studied mathematics at high school. An ellipse is shown below and can be defined as a set of points where the sum of the distances from two other points, known as the focuses, is a constant. the sum of the lengths of the two red lines ,which link C to each focus. The long axis (known as the major axis) passes through the centre of the ellipse and the focuses and is shown as the blue dashed line. The short axis (known as the minor axis) is at a right angle to this is and is shown as the red dashed line. 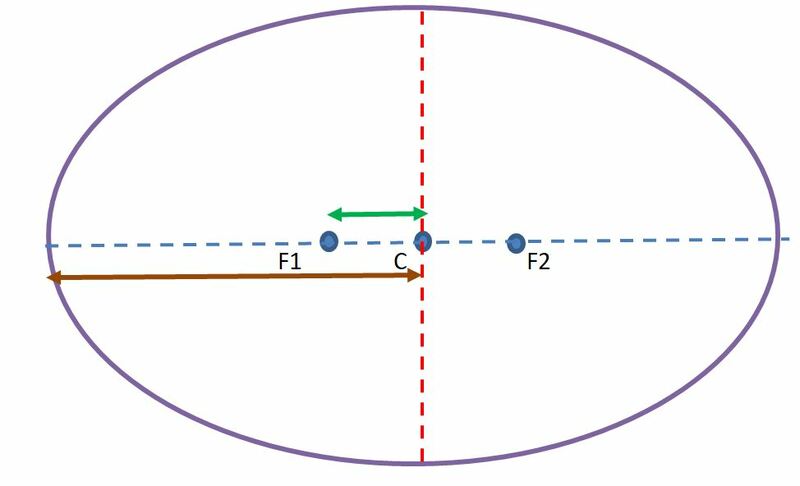 The other key feature of an ellipse is its eccentricity, which is a measure of how elongated an ellipse is. 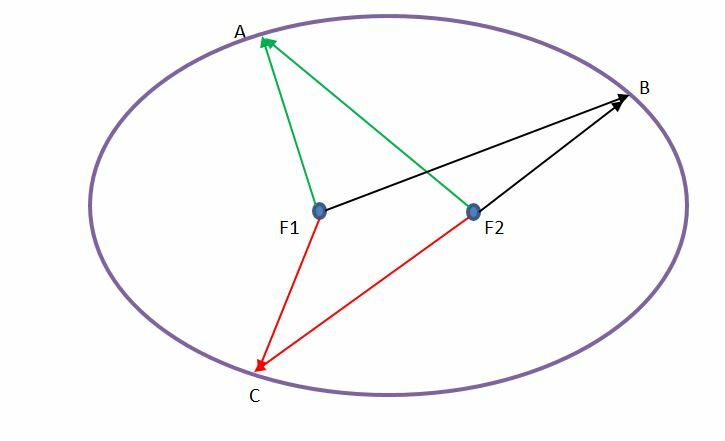 This is defined as the distance between the centre of the ellipse and either focus (the green line in the diagram above) divided by half the major axis (the brown line in the diagram above). The eccentricity is always between zero and one. 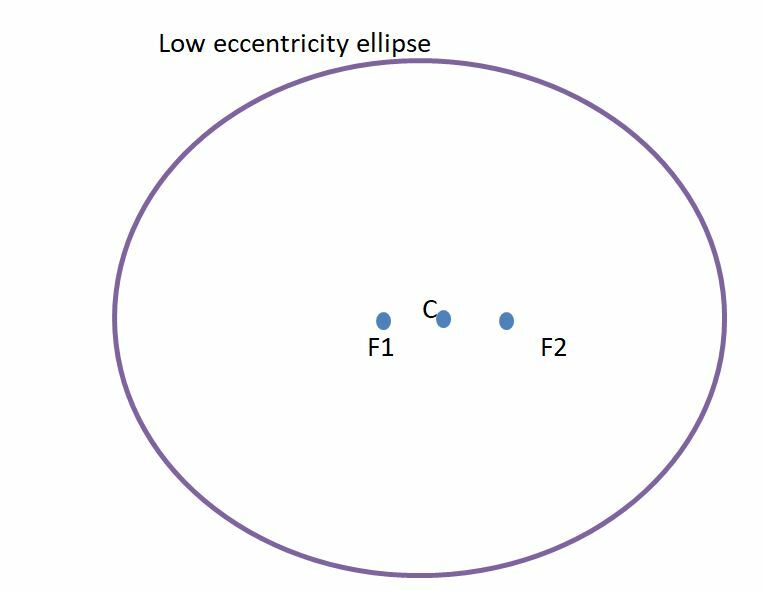 An eccentricity just above zero is close to a perfect circle and an eccentricity just below one is a highly elongated ellipse. Johannes Kepler was born in the town Weil der Stadt near Stuttgart in Germany. At the age of 18 he went to Tübingen University, which in Kepler’s time was one of the best universities in Germany. I understand that this is still the case today. 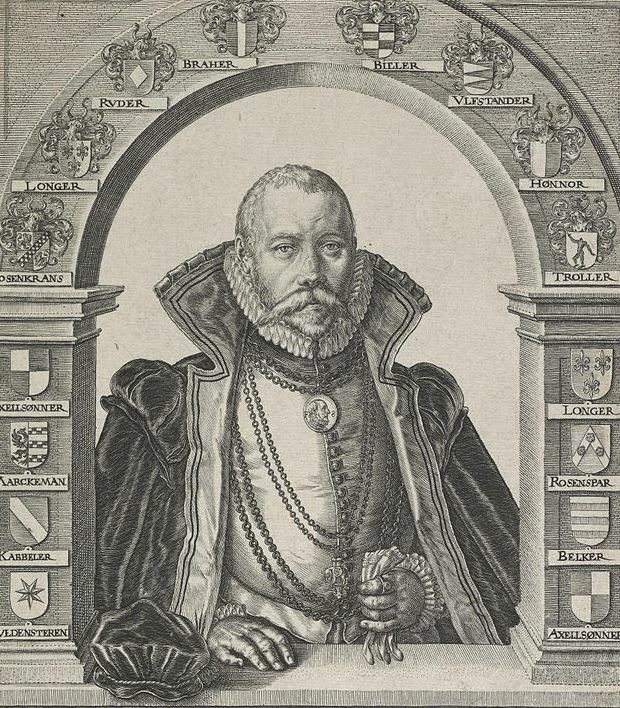 At Tubingen, Kepler studied philosophy, theology and astronomy. He learned both the Earth-centred Ptolemaic system (which was favoured by the church) and the rival heliocentric Copernican system. After considering the merits of both, he became a firm believer in the Copernican system. When he left university, he began teaching mathematics and astronomy. In 1595 he published a book ‘Mysterium Cosmographicum’ defending Copernicus’s system. Interestingly although it was published over 50 years after Copernicus’s death, it was the earliest book defending this system. In 1600, as Kepler’s reputation as an astronomer spread, he was appointed as an assistant to the Holy Roman Emperor’s Imperial mathematician Tycho Brahe (1546-1601), based at the Prague observatory. Brahe was one of greatest astronomers before the invention of the telescope and had painstakingly gathered observations of the stars and planets over decades. Unlike Kepler, Brahe didn’t accept the Copernican system. Instead he invented a hybrid, a ‘geo-heliocentric’ system, in which the Sun and Moon orbited the Earth, while the planets orbited the Sun. The year after Kepler’s appointment, Brahe died. This was good news for Kepler in two ways. Firstly, the Holy Roman Emperor appointed Kepler as the new imperial mathematician, which boosted both his prestige and his income. Secondly, it gave him unrestricted access to Brahe’s data. 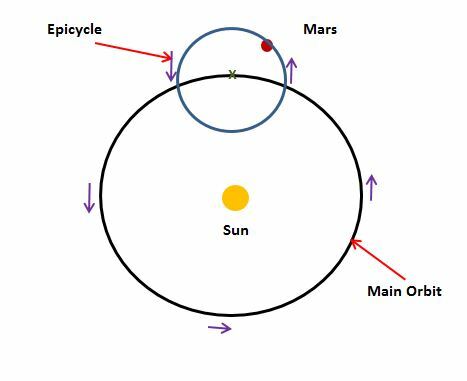 Kepler’s first law – The planets move in ellipses with the Sun at one of the focuses of its ellipse. His first law is shown in the diagram below. The point where the planet is closest to the Sun is called the perihelion. The point where it is furthest away is the aphelion. Half the length of the major axis is known as the semi-major axis. It is equal to the average of the planet’s closest distance from the Sun (perihelion) and its furthest distance from the Sun (aphelion). Kepler’s second law – A line between the Sun and a planet sweeps out equal areas at equal times. This is shown in the diagram below. 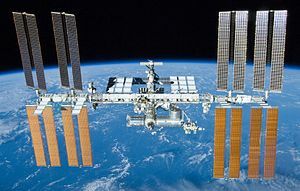 As the planet moves around its orbit, it moves faster when it is closer to the Sun and slower when it is further away. However, the relationship between its speed and its distance from the Sun is such that the area of the triangle is always the same. Kepler’s third law – The square of the orbital period of a planet is directly proportional to the cube of the semi-major axis of its orbit. The third law is useful because it allows the distance to a planet to be calculated. For example, if we take the Earth and Jupiter and measure the periods in years and distances in astronomical units. Where an astronomical unit is the mean distance between the Earth and the Sun. So, if we want to calculate the average distance between the Sun and Jupiter (RJ), then from Kepler’s third law. Putting the actual values in gives. So the average distance between the Sun and Jupiter (RJ) is the cube root of 11.86 squared which is 5.2 astronomical units. Kepler’s three laws have shown to be fundamental laws of astronomy. Although Kepler derived them by analysing the planets’ orbits around the Sun, they apply to any object orbiting a larger body. This includes the orbits of moons around planets and artificial satellites around the Earth. One thing Kepler was unable to provide was an adequate explanation as to the underlying reason about the planets’ motions and why they obeyed his laws. However, his work provided a springboard for Isaac Newton to develop his theory of gravitation later in the seventeenth century. Kepler’s improvement of Copernicus’s system lead to the more general acceptance of the heliocentric system. However this wasn’t his only contribution to science. He made many other contributions including: a new design of telescope, taking observations of a supernova and even has the distinction of writing the first ever science fiction story. I will talk about Kepler’s other work in my next post. The plural of focus is it focuses or foci? When I studied mathematics and physics at high school, we were taught that the plural of focus is foci. This is still the case in formal written British English. However, language changes over time and focuses is now much more commonly used nowadays. Certainly to use ‘foci’ in spoken English can sound affected. Therefore (after discussing the matter with Mrs Geek) I decided to use ‘focuses’ for the plural of focus. Thanks it’s on its way, if can find the time away from the day job to complete it! Thanks for this interesting article, it demonstrates very clearly the relationship between mathematical thought and the ‘heavens’ as some would call planetary/celestial behaviour. The interesting point being that a mathematical/ geometrical theory can then be applied, we think, universally to and that this leads to the concept of universally applicable ‘laws’, leading in turn to wider, philosophical questions as to why and how such laws come into being. From Kepler’s observation, which presumably he depended on Tycho Brahe’s previously collected data, he worked out such a set of useful laws, universally applicable and without which modern space exploration would be impossible. One geometric question occurred to me – how are the focuses (foci?) of an ellipse determined? Thank you grahamd for your interesting observations. I’ll answer your two questions separately. The easiest way of thinking about the focuses is to firstly consider a circle. A circle is a set of points which are all the same distance from another point (the centre). An ellipse it the set of points where the sum of the distances from the two focuses is a constant. If we move the two focuses toghether so that they lie on the same point, then we get a circle. So an circle can be thought of as a special kind of ellipse with two focuses in the same place. When I studied mathematics and physics at high school, we were taught that the plural of focus is foci. This is still the case in formal written British English. However, the plural focuses is now much more commonly used nowadays and to use ‘foci’ in spoken English can sound slighted affected. This I why (after discussing the matter with Mrs Geek) I decided to use the word focuses for the plural of focus. The link below gives a useful way of drawing an ellipse accurately using a pencil, string and two pins for the focuses. By coincidence, I’ve just been revisiting Kepler’s and Newton’s ideas in connection with the development of the priciples of relativity. Interesting your comment about how ‘simple’ we sometimes find modern theories, forgetting the incredible amount of work that went into develping them. BTW, it seems fairly clear that Kepler’s ‘Somnium’ was written (and published) before Cyrano’s sci-fi, but even so there are good arguments for placing the origins of the genre in ancient Greek and Hindu epics. I look forward to reading your next article. which, as I’m sure you already know, relates to his work building on the many discoveries made by earlier scientists, then clearly Kepler would have been a major giant. I didn’t realize Copernicus’s model still included epicycles. I guess the transition from geocentrism to heliocentrism was more of an evolutionary process than I thought. Yes that’s, true to a degree, but essentially it was Kepler who made heliocentrism work. Good to know! I guess I just figured Copernicus’s model was further along than it really was. Let me add that the third law was finalized on May 15 1618. Kepler wanted the printing of his Harmonices mundi libri V to happen in Germany but the Austrian Lords (paying for his work) wanted him to print it in Linz, so Publication was in 1619. Nonetheless this year we celebrate 400 Years of the Third law of Kepler! The math is a little heavy for the average person ( including those who like me had not dabbled in vectors and calculus for a while) but the connections between Kepler’s Laws and Newton are a thing of beauty. 1. Kepler’s first Law can be derived from the idea that there’s a central force acting towards the “center” of orbit. 2. More in tune with history, starting with the equation for an ellipse in polar coordinates, you can derive the inverse square law. 3. Kepler’s 2nd law can be derived from the fact that there’s no torque for a central force. This leads to the realization that angular momentum is conserved, from which we can derive that equal areas are swept in equal time. Thank you for your interesting observations!